Leave the M25 at junction 7 and follow the M23/A23 Southbound to the A27. Follow the A27 Westbound. After the river Adur flyover and then the double set of traffic lights, go straight on (2nd exit) at the next roundabout. Then at the traffic light junction with the Suzuki garage directly on your left, turn left into Busticle Lane. Carry on straight down that road as it changes to Western Road. After the railway bridge, take the second left ,The Triangle, sign-posted Lancing Business Park. Take the first right into Marlborough Road, then the first left into Chartwell Road (one-way system). Chartwell road becomes Marlborough Road again. Carry on round the industrial estate, past Shoreham Vehicle Auctions, then past Manhattan furniture on the right and The Airbrush Company is situated on the left hand side. Follow the A259 coastal road Westbound from Brighton. Continue through Shoreham and go straight on (1st exit) at the mini roundabout with Setyres directly on your left. At the next traffic light junction (Brooklands Park) turn right onto Western Road. Take the first right into Winston Road. Follow round a sharp bend left onto Marlborough Road and then take the first right onto Chartwell Road (one-way system). Chartwell road becomes Marlborough Road again. Carry on round the industrial estate, past Shoreham Vehicle Auctions, then past Manhattan furniture on the right and The Airbrush Company is situated on the left hand side. Follow the A27 Eastbound to the junction with the A24 at Offington roundabout. Take the second exit and follow the A27 Eastbound on Warren Road to the next roundabout adjacent to the Norwich Union site. 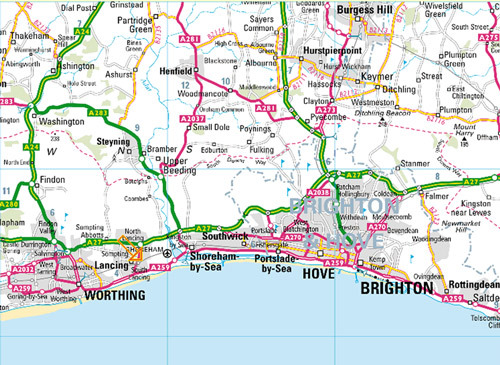 Take the second exit and continue on the A27 along Upper Brighton Road. Continue along this road past the Downlands Pub, the double set of traffic lights and onto the dual carriage way. At the next traffic lights turn right onto Busticle lane (Suzuki Garage on the corner). Carry on straight down that road as it changes to Western Road. After the railway bridge, take the second left ,The Triangle, sign-posted Lancing Business Park. Take the first right into Marlborough Road, then the first left into Chartwell Road (one-way system). Chartwell road becomes Marlborough Road again. Carry on round the industrial estate, past Shoreham Vehicle Auctions, then past Manhattan furniture on the right and The Airbrush Company is situated on the left hand side. 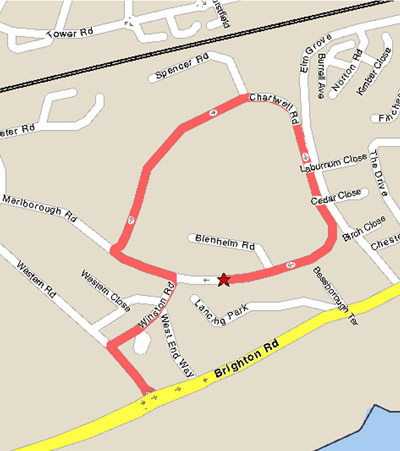 Start out at Lancing Station and turn right onto South Street - B2222. At the T-junction turn right onto South Street - A2025. At the seafront mini-roundabout (Setyres on the South), turn right onto Brighton Road - A259 (signposted Worthing). At the next traffic light junction (Brooklands Park) turn right onto Western Road. Take the first right into Winston Road. As the road bends, turn right at the No-Entry into the one-way section of Marlborough Road (assuming you are on foot!). We are a couple of buildings along on the right. These maps may not print very well as they are low resolution web images. If you are booking an Airbrush Company Training Course, you will receive printed directions with your booking confirmation. Key our post-code BN15 8UF into an online map. Click here for a map of Lancing Business Park in www.streetmap.co.uk.